What is this resource about? This resource highlights the value of using video as part of instructional design and addresses how to make video fully accessible. The Example provides an idea for incorporating video in an educational setting. Learn more about Creating and Selecting Video and how to support Student-Generated Video in the classroom. Why is this important for higher education? Across all disciplines, many instructors have adopted the use of video in instructional settings including face-to-face classrooms, blended learning environments, and online courses. Provide multiple means of engagement: Both instructor use of video and student-generated video can recruit and sustain interest for a particular topic and lead to more meaningful participation in the classroom. Provide multiple means of action and expression: Offer students the opportunity to create video as an active way to demonstrate understanding, particularly for those who experience challenges in the area of writing or live presentation. Provide multiple means of representation: Both instructor use of video and student-generated video can recruit and sustain interest for a particular topic and lead to more meaningful participation in the classroom. Professor Reed is prepping for his upcoming course called Economics of Ocean Resources. He wants to use a video on the first day of class as a way to introduce the subject of ocean economics. To find video that is licensed for open use, he searches You Tube through the Creative Commons Search Tool. He selects this video (see below) which is short and engaging, and provides just enough context to launch into deeper content. Importantly, the video includes captions and a transcript. (This video happens to have open captions, but many You Tube videos include closed captions which can be turned on by clicking the “CC” icon.) Professor Reed plans to show the video in class, but like all the videos he uses, he also posts it on the learning management system where students can log in to view it at any time. "Ocean Economy" is an example of an accessible instructional video licensed for re-use. [Narrator] The health of our nation's economy is tied to the health of the oceans and Great Lakes. [Narrator] The economic benefits that flow from our coasts are immense. [Narrator] The resources of the oceans in Great Lakes create jobs across the country and increase the quality of life for all Americans from sea to shining sea. [Narrator] I live in Iowa. I’ve never even seen the ocean. I grow corn. My brother works in a factory that makes tractors. My sister’s an accountant for a steel mill. I'm a vegan. I don't even like fish. So you're telling me that the ocean is important to my family and our jobs and our lifestyles? Actually, yes. It's like—it’s like this. Think about a spider web in how all the threads are connected together. If you touch any part of it the whole thing shakes. [Narrator] All the parts the economy are connected like that. We export corn to more than 100 different countries—places like Japan and China. The corn business depends on the ocean because some of the corn that you're growing will be shipped through coastal ports to overseas markets. We export tractors and other farm equipment to faraway places like South America and Europe There's a good chance that your brother worked on a tractor that’s plowing a field in Argentina—a tractor shipped overseas through a coastal port. [Narrator] Or think about the shipbuilders along our nation’s coasts. [Narrator] They use lots of steel produced in other parts of the country. [Narrator] And those steel mills employ accountants, like my sister. [Narrator] And didn't I see your sister in California surfing and eating Dungeness crab? [Narrator] A lot of things come into this country through our coastal ports—things we use every day. [Narrator] The goods and services from our coasts and oceans enrich the lives of every American. And the ocean-based businesses along our coasts thrive only with the help from the rest of the nation. [Narrator] It’s like, well—it’s like a great big spider web. [Narrator] I could go on and on, but that’s enough for now. Evidence suggests that many students view video creation as a valuable and engaging activity1. However, like all instructional assignments, students will vary in their perception and response to an assignment that involves video creation. For instance, some may find this a great way to demonstrate their knowledge while thinking creatively, while others may feel so intimidated by the idea of creating a video that they will not be able to convey their understanding effectively. As the UDL principles suggest, consider using multimedia as an option for students to demonstrate knowledge, but offer other means as a way to avoid inadvertently privileging, excluding, or disengaging learners. When possible, teach principles of good video production, including how considerations of content and target audience shape the structure and delivery of the content in the video. Allow students to have direct access to the video so that they can control playback features such as replay, fast-forward, playback speed, and pausing. Choose or create videos that are relatively short in duration or are divided into chapters or sections. Choose videos that are available with captions or that can be captioned by a provider. Captions are not only useful for those with auditory challenges, but can be useful for many learners, including those learning a new language, those accessing the video in a noisy environment, or those who prefer to read along as they listen. The automatic captions now provided on sites such as YouTube are not sufficient to meet accessibility requirements. While the technology behind automatic captioning continues to improve, it is not yet accurate enough to stand on its own without some editing to ensure its accuracy and timing. To be fully accessible to the greatest range of uses, transcripts should also be provided along with captions. 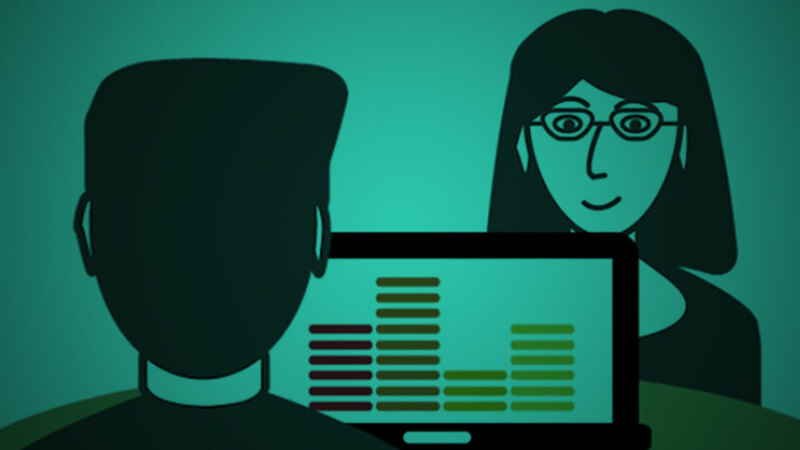 Transcripts provide a text-based version of the content including audio descriptions of visual information and audio content (e.g., laughter, music). Screen reader users often prefer transcripts over listening to the audio content as it is a much faster way to access all of the information presented in the video. Student-created video should also be accessible. The CAST AEM Center has created Teaching with Accessible Video, a resource that goes into more detail about the what, why and how of creating accessible video.